1. One day while we were talking he told me that I should be patient. I had the drive, the desire to write poetry, but I would have to live much more to have enough to write about. He gently explained that I would probably be nearly fifty before I truly found my voice. He was right. 2. Once when I was pounding my head against the wall of prosody he told me a story of when he experienced the same frustrations. It seemed he had an older friend who was both a carpenter and a poet. When Jim told him of his problems, the man threw down his hammer, spit on the ground, and said, "Damn it, Jim, you don't learn how to saw a damn board by reading it in some book! You learn it by sawing the damn board!" How is this relevant to my poetry today? Outside of the fact it allowed me to tell one of my favourite stories, it reminds us that in the end poetry comes down to hard work; those hours alone placing the scratches of our souls down on the enticing blank glare of the page to capture the ever moving instant now. It also reminds us that we should follow our hearts. If your poems are honest and the best you can do, what else matters? All the rest is either "icing on the cake" or vanity. 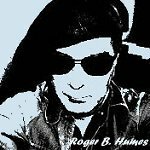 Roger's latest publication is: 'There sings no bird' "A collection of poems built around the Arabic legend of Madjnun and Layla, in this book Humes creates a “poetic canvas” or “concerto of verse” that probes with a unique language and an honest eye into the deepest of human emotions." "I Placed Stones In My Words"
"There Is A Story Told In Whispers"
"Along The Edge Of The Crisp Air"
For I Have Many Names"
"Within The Heart Exists A Shadow"
"They Say You Lay Sleeping"